Home » Historical » Edwardian » Costume sales: Is First-come Fair? The Royal Shakespeare Company’s eagerly anticipated costume sale on September 23, 2017, saw thousands of costume fans queue for hours to get hold of unique treasures. But many towards the back of the queue were left with a gutted warehouse as though a hurricane had torn through it. Nevertheless at the exit gate there were cars being piled full of bags. With prices as low as £5 for breeches and £25 for jackets many people even filled rails and guarded them carefully or marched out with a stack to give to one of their team guarding a super-pile. By the early afternoon the queue round the block meant a four-hour wait and when they got in there was little left. Sitting in the nearby McDonald’s for a coke after the intense heat of the rush within, my partner and I unpacked our bags like Christmas morning. People nearby (besides the family confused by my prancing around in an 18th Century court coat) spoke to us like we were prophets who had seen the great beyond. “How is it,” they said. “Is it worth it?” Their friends remained in the queue with hours to go and the temptation to leave and go home. Entry to the sale was a £3 contribution to the RSC’s new costume department. Could a higher fee have put people off? Unlikely. Given our spend was a couple of hundred for the four bags we could carry on the train, those with vans simply wouldn’t stop when these valuable costumes were so cheap. Perhaps the least-appealing option would be higher pricing of the items and to be honest this would force people to consider what they actually want rather than an approach of selling anything regretted later on eBay. But equally the ethos of the event was anyone could take away some of this stock that was no longer needed and driving up the cost would cast a sad air of profiteering to the event. Should a levvy be be placed on items in the earliest period of the sale? 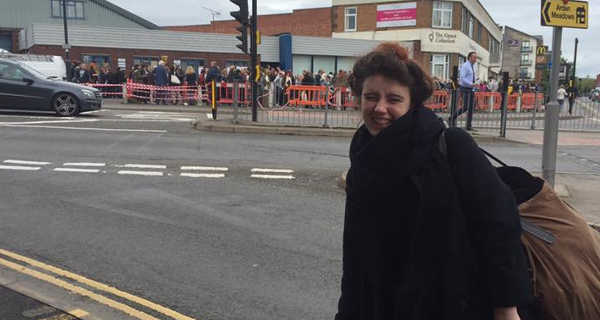 The first 50 people in the queue had free reign over everything in the sale – the perk of getting in first by queuing early but also a big impedement to anyone just 100 people back. At that point anythign remotely valuable could be harvested without having to think twice about whether it was worthwhile.